HERTALAN® RhinoBond® is an innovative system for the mechanical fixing of HERTALAN® EASY COVER membranes, which makes it unnecessary to perforate the EPDM roofing membranes. It is a comprehensive system, whereby the EPDM roofing membranes are fixed to the roof insulation and the roof insulation is fastened to the roof structure. Special pressure distribution plates are used for this, and fixing is achieved by means of induction. 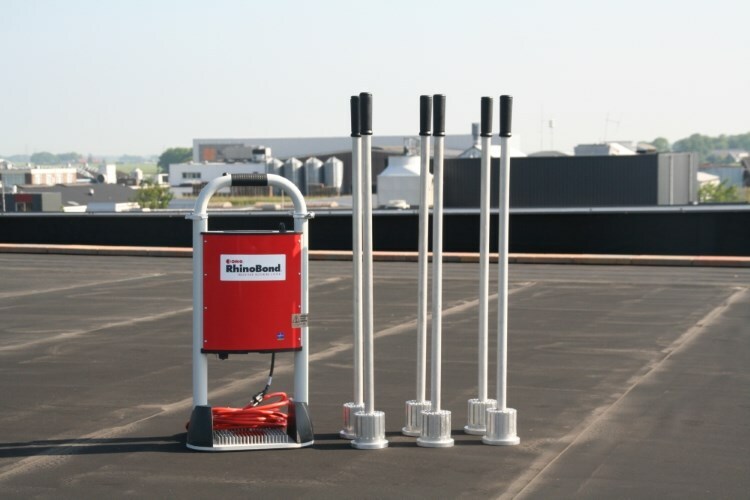 The system consists of HERTALAN® EASY COVER EPDM membranes, RhinoBond® pressure distribution plates (PDP's) and the RhinoBond® induction welding device including weighted magnetic RhinoBond® heat sinks. 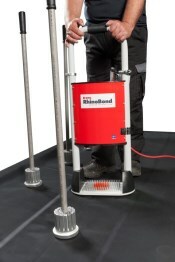 ✓ Efficient installation - "time is money"
The RhinoBond® system offers an efficient and reliable installation method. Because the EPDM roofing membrane is not punctured, there are no areas on the roof where water can penetrate. With the RhinoBond® system, up to 30% less fixing material is used in comparison with traditional systems, subject to the wind load zone and the substrate. As the mechanical fixing is in the main roof membrane, the wind load is better absorbed and evenly distributed over the EPDM membrane. 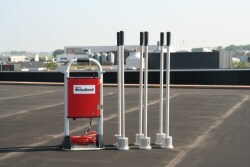 As a result, the load per fixing point is less and the system can handle more wind with less fixing material. The system reaches its full potential when combined with our HERTALAN® EASY COVER membranes and it's unique benefits which increases the productivity of the roofer. RhinoBond® is a patented electromagnetic induction welding technique known under the name Sinch®. Once the RhinoBond® fixing points (PDP) have been placed on the roof insulation the HERTALAN® EPDM membrane is spread out over the roof. The special coating on the PDP's is heated using the RhinoBond® welding device, which becomes liquid. It only takes five seconds to heat. The welding device is activated directly above the PDP. The RhinoBond® welding device is calibrated based on the weather conditions, the thickness of the layer and the power source. Are you looking for expert advice, a non-binding quote or more information about the HERTALAN® RhinoBond® system? Don`t hesitate to contact us. ✓ Take advantage of our many years of experience, completely free and without obligation.